V ICMM Organizing commitee invites the submission of papers (6-8 pages) on the topics of Congress to Journal of Computational Methods in Sciences and Engineering . 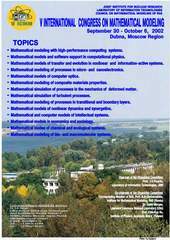 Paper, fully prepared according to the rules of Journal, should be submitted in English by e-mail to:strizh@jinr.ru as LaTeX or Word document files. Each manuscript will be peer-reviewed by two independent anonymous Referees. Once their favourable reviews have been completed, a revised manuscript must be submitted to the Editor-in-Chief. After acceptance of a manuscript by the JCMSE, the author(s) will be asked to transfer copyright of the paper to be published, including the right of the journal to reproduce the article in any of the existing forms of the media to ensure the widespread dissemination of information under the copyright regulations. The Copyright Transfer Agreement will be sent to the author(s) upon receipt of their manuscript and can also be downloaded from the Web page of the JCMSE and must be promptly signed by the appropriate person. Authors may suggest a member of the Congress Program Advisory Commette to handle the review procedure of their manuscripts and may also propose the names of six potential Referees. The final responsibility for the selection of the appropriate member of the Editorial Board for handling the review procedure remains to the Editor-in-Chief. The Editor-in-Chief in cooperation with the Associate Editor-in-Chief and with the Editorial Board will finally define the reviewers of the manuscript. a. Label all your files using the proper extensions, e.g. maintext.tex, fig1.ps, etc. b. Label the submitted disk(s) with the corresponding author’s name and indicate the journal’s acronym (JCMSE). Include the necessary details about word-processing software, compression software and platform (PC, Mac, UNIX, etc) used in creating the submitted files. c. Ensure that the electronic version is identical to the hardcopy of the manuscript and the latter will be used in the case of any discrepancy. d. Do not use excessive layout styling, as the Publisher will remove most formatting codes while processing the manuscripts accepted for publication. e. Do not use automatic word breaking, justified layout, double columns or automatic paragraph numbering. 1. The Title Page, typed on a separate page, contains the manuscript’s title, authors’ names and their complete affiliations, footnotes to the title and/or authors (leave of absence, permanent address, present address…), a running shortened title with less than 40 characters, and indication of the corresponding author with the updated address including e-mail, telephone and fax numbers. 2. The Abstract, typed on a separate page, provides a short summary, not exceeding 200 words, of the main results of the manuscript. A list of at most 8-10 keywords must be appended to the Abstract together with 3-5 most recent PACS numbers and/or AMS(MOS) Subject Classification numbers and/or CR categories numbers. A careful selection of the keywords and PACS, AMS(MOS), CR categories numbers should be made to facilitate abstracting, indexing and/or searching following the subject of the manuscript. 3. Free-standing equations must be typewritten and the associated numbers placed in round parentheses on the right margin. Reference to a particular equation must be indicated by a number within these parentheses, e.g. Eq (1). 4. Superscript numbers associated with words in the text are reserved only for footnotes. All the footnotes must be typed together on a separate page with double line spacing. 5. Figures and original photographs must be in their final good quality forms suitable for publication. Line drawings must be done on an original laser printer or plotter output or drawn in black India ink, with careful lettering which is sufficiently large to remain legible after reduction for printing. Photographs must be original, with somewhat more contrast than what is required in the final version of the manuscript printed in the JCMSE. The photographs should be unmounted and their top sides should be marked whenever needed. These artworks must avoid clutter due to an eventual excessive number of curves. If experimental data are displayed, clear standard symbols must be used. The authors must enumerate all the figures following the Arabic numerical system. The number of each figure must be indicated on the back of the figure where also the first author’s name should be handwritten in pencil. Text and letters on figures must be created using the standard packages with the necessary high-resolution computer graphics. The size of figures must be large enough to enable the adequate reduction for publication purposes. No figure should be encapsulated i.e. imported into the text of the manuscript and each figure must be given on a separate page with an accompanying and descriptive legend embedded in the figures. Figure caption typed on a separate page must succinctly describe the relevant text referring to all the figures in the consecutive serial order of their appearance. Figure captions must precede the display of all the figures. Preferred format for figures are PS, EPS or TIFF created with the conventional packages e.g. Corel Draw, Freehand, Adobe Illustrator - version 3.0 and beyond. Caution has to be exercised with figures made using Word or WordPerfect, as these may occasionally possess insufficient resolution. If files of scanned line graphics, scanned halftones and scanned line/tones are used, they must have the resolution of 1000 dpi, 300 dpi and 500 dpi, respectively. 6. Colour figures can be used if this is essential for the presentation and interpretation of the results. Authors will be charged for colour reproduction and further information on this can be obtained directly from the Publisher. Black and white photos, micrographs and the like must not be saved as colour. Colour illustrations must be scanned in at 300 dpi and the resolution should be 500 dpi for colour/line tones. For large files of any figure, compression must be used prior to submission and the compression software must be indicated. 7. Tables must be numbered in the consecutive serial order of their appearance in the text using the Roman numbers. Each table must be typed on a separate page with double line spacing. Short and descriptive captions to tables must precede all the depicted tables. If a table grid is used in creating tables, only one grid must be used for each separate table. When a table grid is not implemented, tabs must be used to align columns. 8. Acknowledgement must be placed right before the bibliography i.e. references. 9. References must be cited in the text by indicating the numbers in the square brackets, e.g. . The references must be placed at the end of the manuscript, after possible appendices, on separate pages. Enumerating references must follow the consecutive serial order in which they are quoted in the text.
. T.E. Simos, An accurate eight order exponentially-fitted method for an efficient solution of the Schrödinger equation, Computer Physics Communications, 125, pp. 21-59 (2000).
. T.E. Simos and Jesus Vigo-Aguiar, A modified Runge-Kutta method with phase-lag of order infinity for numerical solution of the Schrödinger equation and related problems, Computers & Chemistry, in press.
. L. Gr. Ixaru, Numerical Methods for differential equations and applications, Reidel, Dordrecht-Boston-Lancaster, 1984.
. T.E. Simos and P.S. Williams, A family of Numerov-type exponentially fitted methods for the numerical integration of the Schrödinger equation, London Guildhall University, Department of Computing, Information Systems and Mathematics, Working Report 97/01, 1997. The above pattern need not be followed for review articles with a large number of references from which the titles of the cited papers may be omitted. 10. Overall the following order must be respected while creating the manuscript to be submitted to the JCMSE: Title, Authors, Affiliations, Abstract, Keywords, PACS-AMS(MOS)-CR, Main text, Acknowledgements, Appendices, References, Footnotes, Figure captions, Figures, Table captions, Tables. 11. Files in the pdf format for galley-proofs will be sent only to the corresponding author. To avoid publication delay, only corrections of typographical errors will be allowed. The proofs must be sent by fax to the Publisher within 48 hours from receipt of the pdf file. 12. In total, 25 reprints free of charge of each manuscript will be sent to the corresponding author. Additional preprints may be ordered from the Publisher.